Mandala is a Sanskrit word meaning the circle and reflects the universe and everything in it. 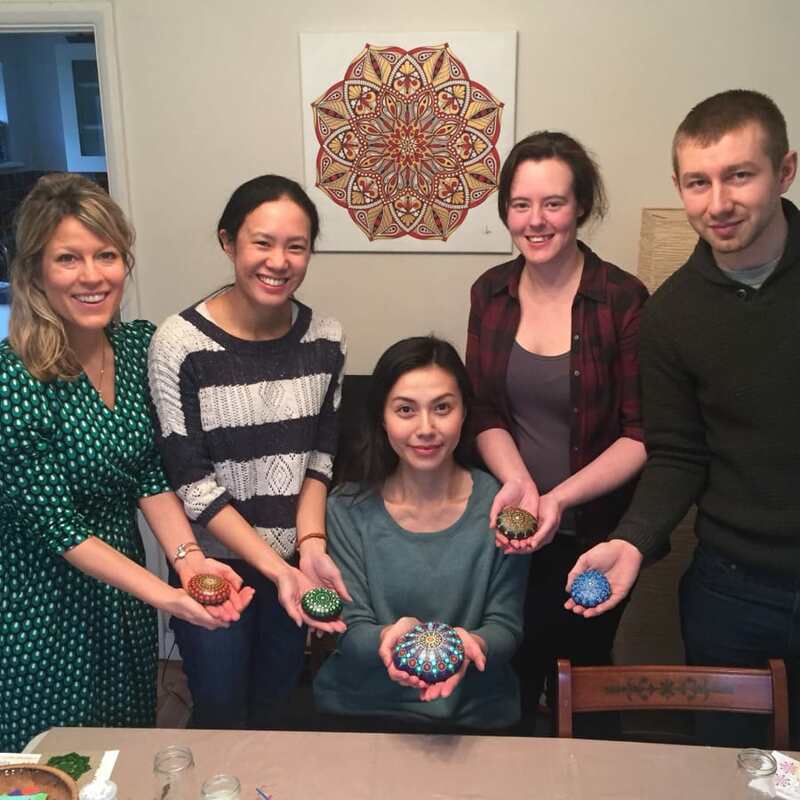 Our Mandala Drawing and Painting Classes have been immensely popular so we are very excited to launch our brand new, unique Mandotla paint dot class. 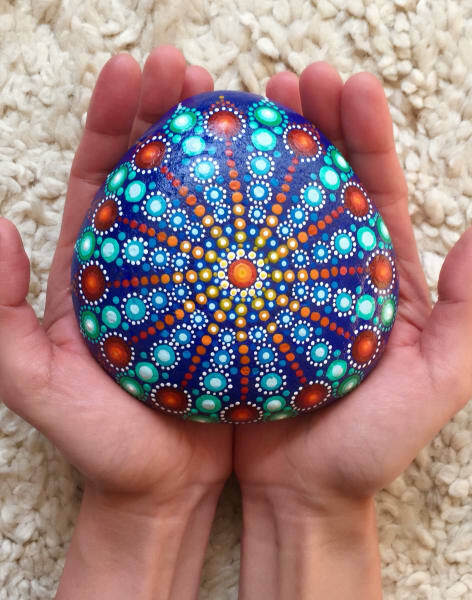 Mandalas are beautiful symmetrical creations that can be as intricate as you wish. We use some of the skills from our Mandala courses but also blend them with paint dotting techniques to create fabulous 3D objects on natural products including stone, canvas or wood, the choice is yours! Many of Ubie's students say they could never paint something as apparently difficult as that. Well, you can !! You just need to know the tips and tricks of how and therefore the course is suitable for all levels of ability! Mandalas are well known symmetrical creations. We love them and so have our many students. 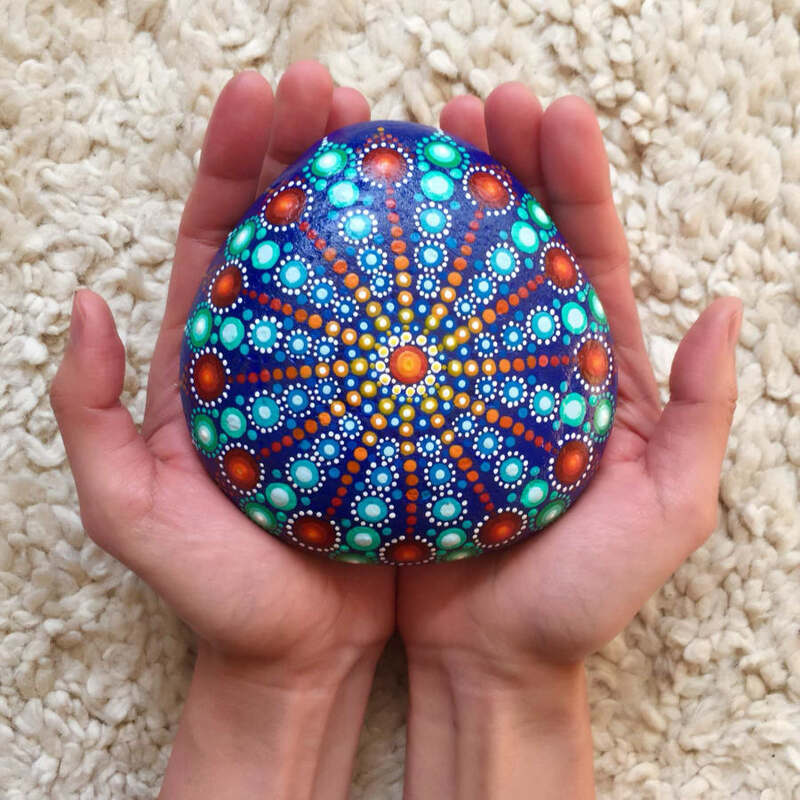 Mandotlas though - well that's our name - it encapsulates our love for both Mandala artworks and the beauty of paint dotting techniques! Had such a lovely time, and came away with an item i’m really proud of! The class was calming and easy to get stuck in - Ubie is lovely, has a gentle and enthusiastic manner, and all the tools and kit were really great too. The hours flew by. I would definitely recommend this class for a bit of art & mindfulness, and would definitely book another class with Ubie. What an incredible 4 hour course! I can't praise Ubie's Mandotla paint dotting class highly enough. From the moment we arrived, Ubie and Matt were so warm and welcoming to their studio. Refreshments were provided throughout the course. Ubie is the most wonderful teacher: she exudes so much enthusiasm and passion and took a great deal of time with each of us to help with our designs and the painting dotting process. It was a really relaxed and sociable morning with like-minded souls. The end result was unlike anything I could have hoped for - I'm so happy with my stone! Thank you both for the best course. I fully intend to return asap for more Mandotla paint dotting, as well as Mandala painting! Mandotla with Ubie was such an amazing experience. As always with all her creative inputs and techniques, she always makes it so simple and easy to follow and created one of your own. I love the fact that I can walk into her house with absolutely nothing, not even a pencil and come out with a great art piece. She organise it all very well. Me and few of my friends did an all day workshop with Ubie and we all had a great time. Both Ubie and Mat are so welcoming and heartwarming. Always makes us feel very comfortable that time simply flies. I highly Recomended this workshop with Ubie. Ubie was an amazing teacher and so so welcoming. There was a small group of 4 and we were all there on our own. I was a bit nervous to go alone as I thought it may be groups of friends however there was no need to worry. Everyone was very friendly and the class really made me feel relaxed. There was even relaxing piano music playing in the background and tea and buiscuits. I can't recommend this enough and will certainly be going back to do all of the otheir classes. A great afternoon learning an interesting technique. Great for those who love attention to detail, like me. And you get to make your own stunning piece of art to take home! Ubie was very friendly and welcoming. Loved this class. In Ubie’s living room, which gives the class a homely feel. Ubie was very sweet - enthusiastic and patient, gently helping us make the most of our class, suggesting how to improve designs, and subtly correcting bits that has gone wrong. It was a lovely mindful class, and I’d recommend it to anyone. Also great to have a fully finished item when leaving. Ubie was a great teacher, clearly passionate. Thoroughly enjoyed this, left with a finished piece of work and the time flew by. This workshop takes place in multiple different locations. Click on SEE DATES to see which workshop takes place where. UbieDesign was established by designer, Ubie Chan in London in 2017. Ubie hails from Hong Kong and relocated to the UK in 2017. She is a qualified graphic designer and ran an art and craft studio and shop in Hong Kong for many years. 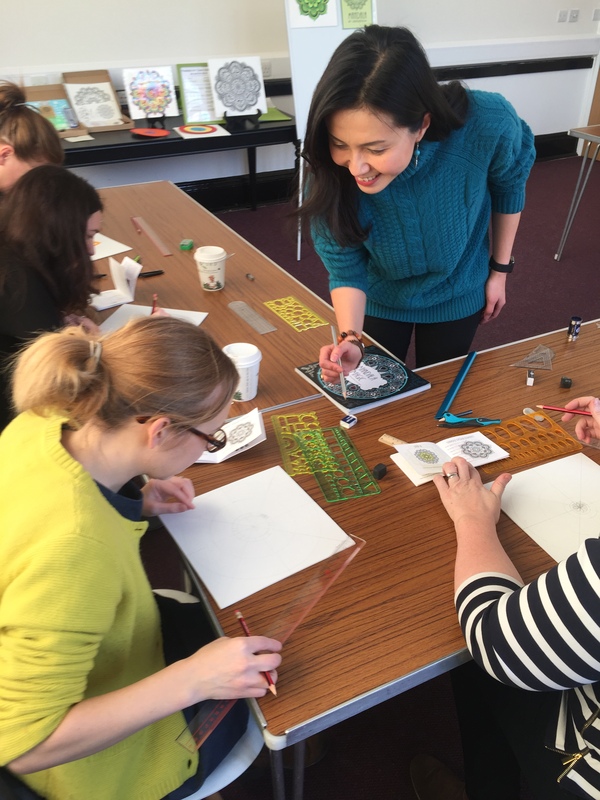 Ubie's classes in Mandala Drawing and Painting have been a 'big hit' with our students being amazed in the beautiful work they can create in a short period of time in a very relaxing, mindful and creative environment. We have recently launched our new class Mandotla and more will be coming in 2019! Ubie's mantra is "Anyone can draw!!" and she will demonstrate this in a smaller class environment (typically no more than 8 students) with lots of time for 1-2-1 tuition at your level of skill and confidence / experience level in drawing and art! Everything is included. This class is 'come as you are'. Whether you have come after a hectic week at work or a busy time watching the kids, we’ll get you in the right mindset and help you create something beautiful During this class, you will create a Mandotla and learn lots of great art techniques! You may also enjoy learning about our Mandala Painting and Drawing classes which are also listed on Obby. You need not have attended this course first though to really enjoy the Mandotla experience!